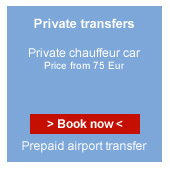 Airport shuttle is the most convenient door to door service in Paris. 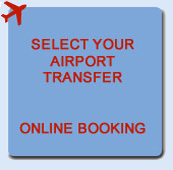 It is indeed operated at flat rates and can (and must) be prepaid the day before your arrival or departure. Two different services available: Shared - Meaning that you share the van with other passengers (In that case the driver will stop a couple of times before getting you to your hotel), Private - A private chauffeur car service proving a direct non stop door to door premium service (The driver is waiting after customs with a board with your name on it). Service is operated from or to any of the three airports serving Paris : Roissy Charles de Gaulle (CDG), Orly (ORY) and Beauvais (BVA). Other routes include Versailles Castle, Disneyland, Paris suburbs and major convention centers or stadium (Villepinte Paris Nord, Paris Expo exhibition center, Bercy, Stade de France) as well as train stations - railway (Gare du Nord, Gare de Lyon, ...). 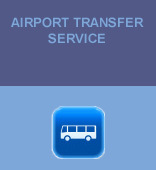 How to book your airport transfers ? Just click on the Book now button and follow the booking process. After receiving your booking confirmation please print the voucher. The driver may ask for it at the airport. Arriving to Roissy Charles de Gaulle, Orly or Beauvais ? Only metered taxi services are available at the airport. So how much will cost a taxi between airport and city center ? Taxis are waiting in front of each arrival terminal. Prepaid taxi service is only possible if you already have an account with one of the major taxis firms. 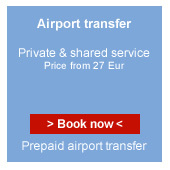 Regular airport coach services are operated between Roissy Charles de Gaulle, Orly or Beauvais and Paris city center. 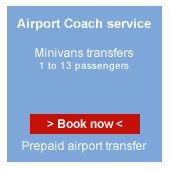 Ryanair Coach service in Beauvais, Orlybus and Roissybus or Air France Bus for Roissy and Orly Airport... Bus tickets price is low but this is a not a door to door service and it is not possible to book online in advance. You need to buy your tickets at the very last minute onboard. Please note that these services may be affected by strikes. We recommend you first to locate your hotel downtown Paris before choosing a bus tranfer as you may need a taxi to connect between bus terminus and your hotel. Connection between airports or train stations is also operated : Please use the selector, choose the location of departure and then indicate your destination.